Looking for the perfect setting for a wedding, banquet, or other special occasion? Need a place for your group to hold meetings? Spacious for small or large group needs. Air-conditioned and accessible for guests with disabilities. Loop sound systems for the hearing impaired. 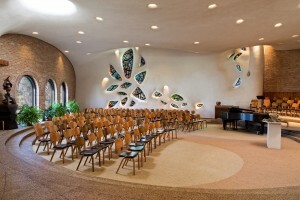 Our Sanctuary is a unique and beautiful space for a wedding, concert, or other special occasion. The total square footage of the Sanctuary is 3641 and seats 300 persons comfortably. The piano and organ are available for an additional fee pending prior approval from the Music Director. Fellowship Hall is a large open space suitable for memorial receptions, private parties, and any other event requiring room to move. The total square footage is 1255 and seats up to 100 persons. A loop sound system is available, and tables and chairs are included in rental fee. The Kitchen (pictured below) is adjacent to Fellowship Hall and is available for an additional fee. Our building features six to ten classrooms of varying size roughly the same in size and layout for small groups of people who need a quiet space to meet that is full of natural light. Who Can Rent Our Space? For information about availability, eligibility, accessibility, fees, or just to get started with your rental request, please contact the church office at 847-235-1958 or office @ nsuc.org. Our church is a wonderful place to celebrate the important moments of life,including weddings and memorial services. Whatever your philosophical or religious persuasion, we welcome you to consider having your ceremony at our church. Minister: Rev. Lucas Hergert is available for services for members and their immediate family, and he can help non-members connect with a Unitarian Universalist minister who can officiate. Music: We can often provide you with a pianist for your service. Our talented musicians will choose music that creates a beautiful and meaningful experience. Please note that the fees for our musicians increase due to shortened lead-times or the complexity of the request. Memorial Form: In order to have a memorial at North Shore Unitarian Church, the first step is to fill out the application form. If you would like to schedule a wedding, please contact our church office.